A premium food tasting experience designed exclusively for guests who prefer to enjoy the best of Vietnamese cuisine, in a more classy and comfortable setting. Be inspired by the traditions behind each dish, the ingredients used, and the unique methods of preparation. Your foodie host will also demonstrate how these delights are best enjoyed with a glass of New Zealand Sauvignon Blanc, or a German Riesling. And for diners who prefer non-alcoholic beverages, delicious mocktails are available on demand. Finally, your host will also give you a very local perspective of the food culture in Vietnam. 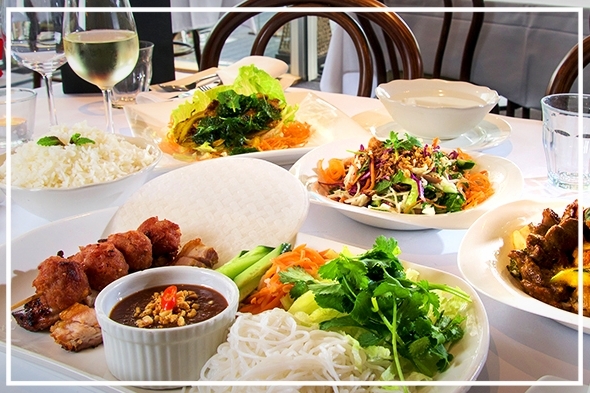 Sample 5 Vietnamese dishes in a restaurant setting.